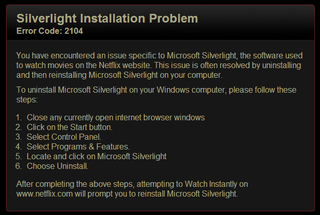 Netflix, Chrome and Silverlight have fallen out on my PC...HALP! So there I was just innocently interneting away when i thought i'd watch some Top Gear. Its what i do in lieu of an actual exercise regime; 30mins here...an hour there.... its all good. Only today, I ran straight into a brickwall of sadness... Error Code 2104, there is a a problem with your silverlight installation. So i've tried all the solutions I could find and i've got nothing. Nada. Zip. Bupkiss. Anyone else ran across this and what creature did you sacrifice in order to make the universe right again?